If you've got an enthusiastic DIYer around the house, your kiddos are probably more knowledgeable about tools and gadgets than their peers. I bet they would be thrilled to have their own set of pretend play tools to build, create, or fix things. 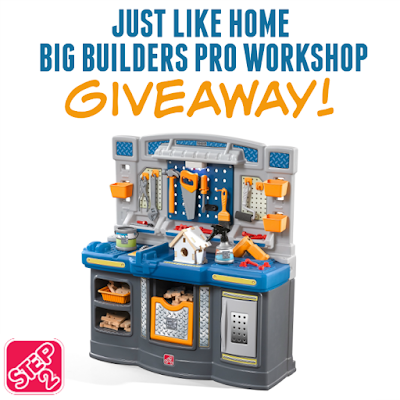 The new Step 2 Just Like Home Big Builders Pro Workshop comes with an incredible assortment of fun items that will keep your little one busy and entertained. Enter to win one for free! 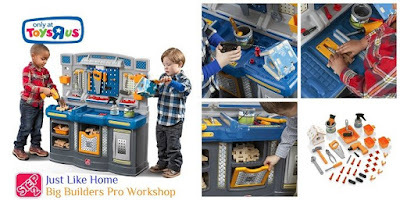 Amber from Viva Veltoro recently reviewed this new Toys "R" Us exclusive workshop from Step2 and her daughter has been having a blast with all of the cool features. Be sure to check out her review to see it in action! One lucky reader will win a Step2 Just Like Home Big Builders Pro Workshop (ARV $129.99)! Giveaway ends 9/28. Open to the Continental US 18+ only. Please enter using the Giveaway Tools below. Good luck!